Please Note: The bullet points are a faithful recount of what panellists and speakers said during the course of a nine hour conference. In some cases, however, the speakers were simultaneously translated from Mandarin to English and then recorded. There are no doubt flaws in reporting. Instead of a faithful transcript of the second day, this post provides an overview of the major issues. 。 2.5% of industries in China are in technology. We don’t have big groups that can compete internationally. 。 We must innovate in key technologies and move from lower end to higher end. We cannot buy key or core technologies. In the past we could exchange technology in market. That era has passed. Now we must develop within. “New Prospects: New Indexes For Measuring Economic Success Required? What indexes are best to determine China’s current economic performance? What is the silver lining for the China’s economic index? 。 How can we stabilise growth? 。 In Fortune 500 list, Mainland enterprises increased significantly – now 89 companies. But only 7 are from private sector. 。 50% of total profits from China’s corporations come from the financial sector. 。 Excess overcapacity. High interest rate payments. Local governments relying on bankrupt businesses for revenue. 。 The bubble does not explode yet. The crisis hasn’t hit yet. What are the big responsibilities for large corporations in terms of industry optimization? How to increase innovation abilities to push industry optimization? How the large corporations motivate and lead the green development of the whole industry chain? 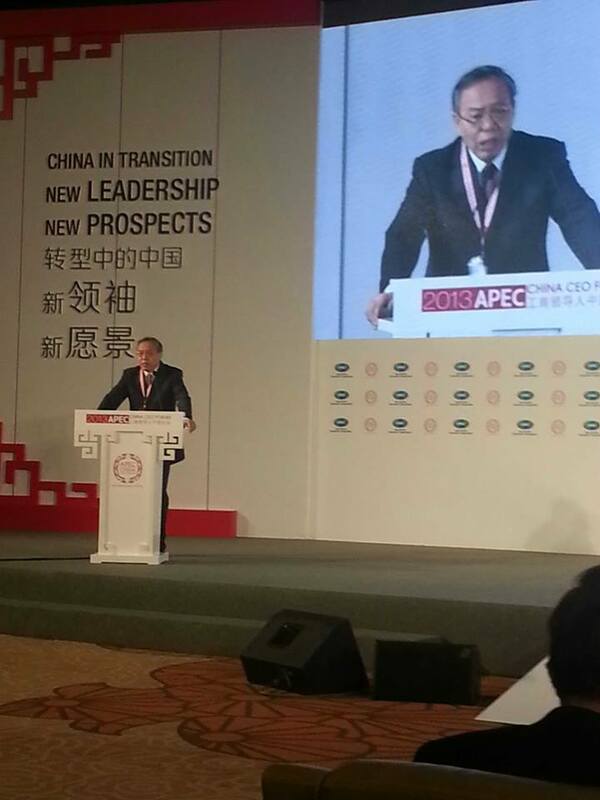 Chen Jinya, Global Vice President and Asia-Pacific President , Alcoa Inc. Same phenomenon occurring in China today – mass migration due to economic growth. NGO growing and becoming larger. When it happened in USA it was a national economy – constrained within USA. Today it’s a global economy. The business cycles and social disruption that much faster. China Mobile after years found TenCent as their real competitor – not China Telecom or China Unicom! Third manufacturing revolution – new materials, internet, new methods of production. A new round of competition. In the innovative technology field, men are still in the dominant position, how to advance an equal development for women? In the eyes of women leaders’, from where to drive the changes? By means of technology, how can women leaders use technology to change their current business for further development? When internet is engaged in the basic business environment, from where can we generate profits? For traditional companies, how can they step into the era of internet? And whether using internet is the sole choice for them. What kind of business world will be reshaped by internet? Yu Yongfu, Chairman and CEO, UCWeb Inc.
Peter Wong Man Kong, Chairman, Fortitude (Group) Co., LTD.